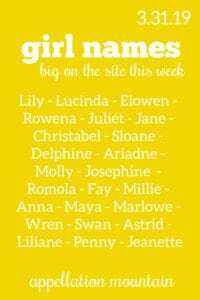 It’s been a week packed with girl names of every variety – and I’m surprised by how much I’ve liked them all! Singer Kehlani named her firstborn Adeya Nomi. I’m not clear if the name has a specific origin, but it’s worth noting that Kehlani’s name has rocketed up the charts along with her music. Xia is the first child for Harry Shum Jr. and Shelby Rabara. We love a mini name, and an -ia ender, too. Mia has occupied the US Top Ten for nearly a decade. Lia, Gia, and Nia chart in the Top 1000, too. So why not Xia? As it happens, it’s a traditional Chinese given name, which reflects Harry’s heritage. Here’s my favorite of the week: Bernadette! Bernie is the first daughter for Food Network’s Molly Yeh and Nick Hagen. Which reminds me: the big screen adaptation of Where’d You Go, Bernadette? comes out in August. Could this be the spark that helps put Bernadette back in the mainstream? The trailer looks all kinds of fabulous, and it’s Cate Blanchett in the title role. March Madness Baby Names 2019 ended with Arlo and Margot coming out on top! Arlo made it to the finals three years running, so it was fun to finally see the name win. Though if we’re talking about actual basketball-inspired baby names, here’s another contender: Zion, as in Duke freshman Zion Williamson. And you thought naming people was tough. I’m not likely to see the new Jordan Peele horror flick Us any time soon, so I just skimmed this (spoiler-packed) look at character names. Could Adelaide, Zora, or maybe even Abraham or Io get a boost from the movie? So many great names on kids’ television right now! Duana refers to the trapeze-swing feeling of a name under consideration by a reader, and I agree completely. Sometimes the best names break all the rules. Ha! 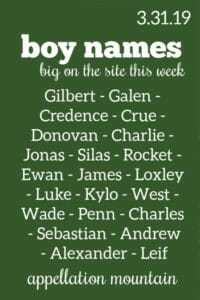 I mentioned Sid in this month’s mailbag, and here’s Sidney featured on British Baby Names! I love the Design Mom Living With Kids home tours, but the #namespotting is even better. This week: a toddler named Zadie. That’s all for this week! 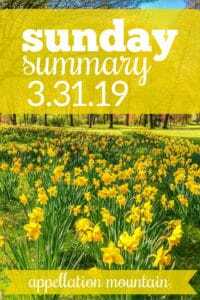 As always, thank you for reading – and have a great week!